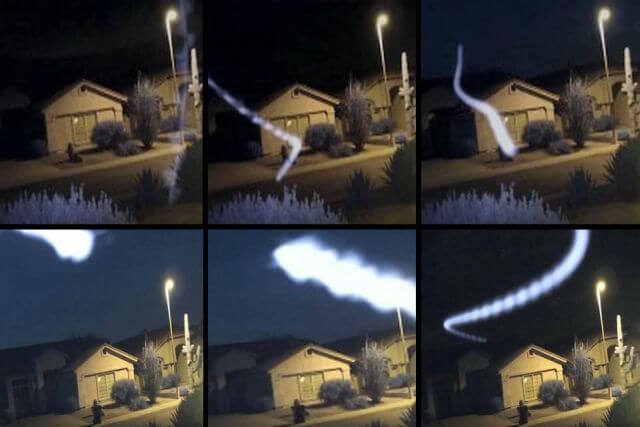 Video shows two mysterious home security camera UFO sightings. The first sighting captured on March 31, 2015 shows a bright Orb which appears from behind the trees. The second part of this video features surveillance camera motion detection activated photos. I was shutting down my computer when the motion detection alarm sounded on my computer. I checked the camera video but there was nothing on it. Checked the still photos and that was when I found the images. At first I thought it was a firefly or something of that matter, but realized that fireflies don’t leave trails like in the photo. I didn’t pay much attention until it showed up the second and third night. That was when I thought it was something different. I was not able to observe it firsthand, I only saw it in the photos. After the second night I thought it was kind of spooky.